The girls’ closet is not really a closet. A better title for this pleasant little space is dressing room; it is essentially an extension of their living space that just happens to have clothes hanging in the corner. Quirky spaces, like this closet, come hand and hand with an old home; these spaces give our home a unique character, an individual life, a nostalgic story. Without stepping outside of the originally allotted space, we took this limited and cramped area and created a delightfully light filled dressing room and bathroom flowing from one into the other and finally into the girls’ bedroom. We will feature the closet today. Tomorrow we will see the girls’ bathroom. Upon purchase, this area was the master bathroom which attached to the master bedroom (originally the sleeping porch and now the room that is now becoming our playroom.) Because we added a new master area to the back of the house, we no longer needed the master bathroom in this location. So our question was: What can we do with this rather narrow space at the front of the home sandwiched between the playroom on the East end of the home and the girls’ bedroom on the West? The old master bathroom space was too small to convert into a proper bedroom and the girls’ bedroom needed a bathroom and closet. Well, I guess it wasn’t too hard to decide what to do; sometimes necessity and physical reality give the best answers. So we set about creating a closet for two precious girls filled with clothing and accessories, glittering sunlight and sparkling moonlight, pitter pattering raindrops and pitter pattering feet, joyful songs and delightful laughter, shared moments of gleeful happiness and heartbreaking sadness, and of course some dramatically slammed doors and fiercely stomping feet; in essence, a room filled with sisterly memories. Let’s take a look back at the transformation from dated master bathroom into our charming girls’ dressing room. Below: Original bathroom had a wall of shallow closets. Great hiding spot! Also hiding behind this wall of closets and drywall was another hidden window! Below: Master sinks with toilet and tub behind the wall of mirrors. You can also see the wall of closets reflected in the mirror. Below: View out the original master bathroom windows onto the front lawn. Below: Master bathroom removal underway. Below: Closets in the bathroom removed revealing the original window hidden behind shutters and a wall patch. Below: All remnants of the bathroom removed, including the mirrored wall between master sink vanity and tub and toilet. The girls’ bedroom is just on the other side of far wall without any windows. Below: Doorway knocked out of the girls’ bedroom wall to connect to the new bathroom and closet beyond. Below: Exterior shutters removed and last remnants of the master bathroom closet wall removed. Below: New wall between the girls’ bathroom and closet. Here we are looking through the new closet door back through the new bathroom and on into the girl’s bedroom. Below: New door installed in the new wall built to separate the new closet from the new bathroom. Below: Looking from the girls’ room through their new bathroom and on into the new closet. Below: Our view on Halloween, the girls’ closet cabinet structures installed and painted! Below: And here we can look back from the closet and into the new girls’ bathroom with their bedroom beyond. I think we will put a sweet little vanity and mirror along this wall between the windows and the doorway. It will be a nice little spot for these lovely sisters to brush each others hair and chat about life. 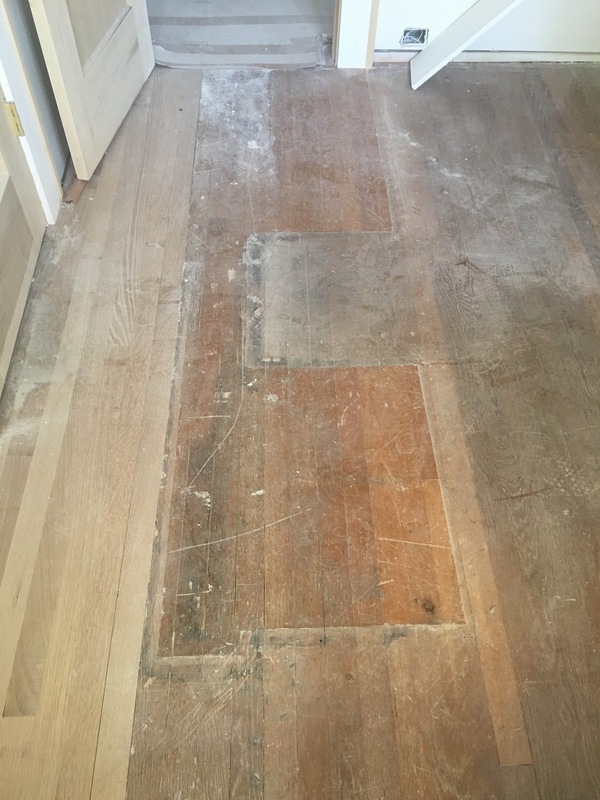 Below: The protective floor covering was removed for about a day so the cabinetry could be installed. Look what still remains, a small reminder of the old master bathroom vanity. I love the stories and memories this old house continues to share. Previous Post Room to Play. Next Post Kitchen Tile Floor.